Dubai is one of those cities that are home to some of the most amazing skyscrapers. It had been constructing a number of iconic towers throughout the city. These extraordinary buildings have made Dubai an interesting place in the Middle East. It has become one of the most attractive tourist destinations in the region. The number of extraordinary buildings in Dubai are increasing every year. And, most probably, the city is going to present another exclusive structure within a few years. This crazy structure is supposed to be a crescent shaped tower - The Crescent Moon Tower. America based design company Transparent House has presented this exclusive design for the structure. 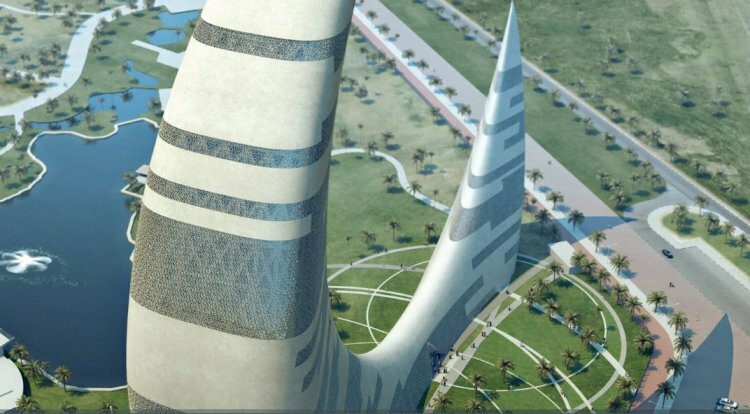 The Crescent Moon Tower is supposed to be erected in Za'abeel Park in Dubai. This Tall Emblem Structure will be a unique structure in the world. - The Crescent Moon Tower is an architectural design project submitted to the 11th ThyssenKrup Elevator Architecture Award by Transparence House, a California-based firm . This idea was developed and rendered because of the challenge to design a tall emblem structure for Za’abeel Park, a park that is located in the north-east of the Dubai World Trade Centre. 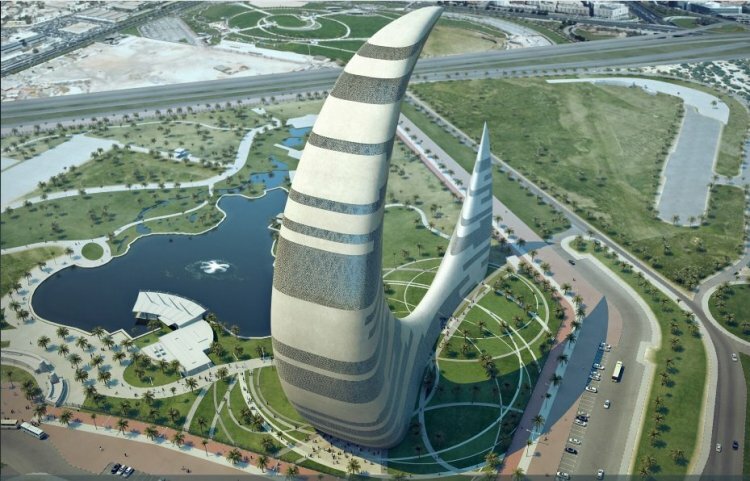 This unbelievable building is designed not only to symbolize the Dubai as part of the Islamic world, but also shows the technology and economic development in Dubai.This Crescent Moon Tower boasts a 33-storey down-turned half moon on the banks of the Caspian Sea. It is designed to accommodate a children’s library, a conference facility, a restaurant, multiple cafes, and an open-air observation platform. Though it was just a proposal, there’s a big possibility that it will be built immediately. It is said to be completed by the year 2015 along with its sister project called the Full Moon Hotel – resembling the Death Star from Star Wars which was been proposed. It can accommodate a 220-hectare site that was formerly a storage hub for the industry. This place now has been cleaned up and prepared for offices, hotels, homes and services for 50,000 Baku residents and 48,000 workers. According to the design company, this unique structure will identify Dubai as belonging to the Islamic world and will also be a manifestation of the modern level of technical and economic development of Dubai. It will signify the new face of the city and promote its tourism, recreational, scientific and cultural activities. 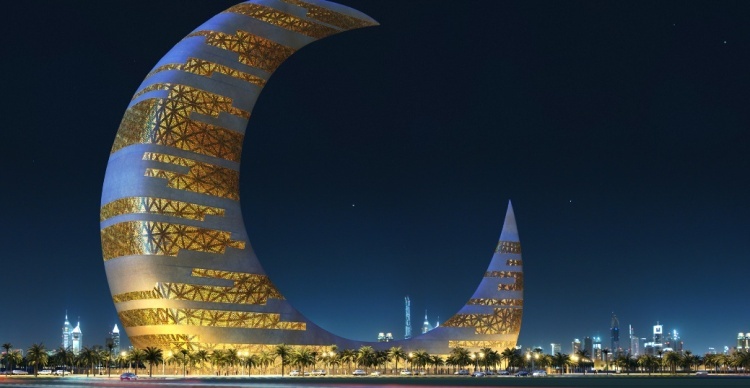 Crescent Moon tower in Dubai is only a proposal. However, keeping Dubai's madness towards iconic buildings one can expect to see the building in reality in the coming years. If it is erected in real, this amazig tower will bring Dubai to a new phase, that's for sure.